The PlayStation 4 media player supports various movies and videos encoded in popular formats like MKV, AVI, MP4 and MPEG2. On top of that Sony recently released a new software update which gives you the ability to playback videos and music as well as view photos straight from your USB stick. While these great features make the sought after gaming console a very capable and practical media center for home use, it comes with just one small snag- the controller. Don’t get me wrong, the PS4 controller is perfect for gaming, but if you have ever used it to browse through the menus, you’ll know what I’m talking about. The PlayStation 4 controller just isn’t designed for navigating between various streaming services and controlling video playback. Fortunately for us a guy from Austin, TX has just built a device which will make our lives a lot easier. There are many different universal remote controllers available on the market which allow you to control almost any device that uses infrared technology (IR). Unfortunately PlayStation 4 uses Bluetooth so you can’t use an old universal remote as your PS4 remote controller. It’s true that you can find some unofficial PS4 remotes on the internet today that sort of work, but aren’t really doing the job very well as you can’t power on your PlayStation 4 console directly from the remote itself. Quite an annoyance if you’re after a more serious PS4 media remote controller. 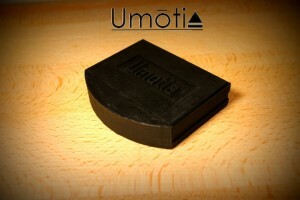 This is where Umotia, the device I mentioned earlier, comes into play! It’s a fairly simple yet ingenious gadget built by Norman James that allows you to use virtually any universal remote controller to control your PlayStation 4 console through the HDMI Device Link feature. Simply enable the HDMI Device Link feature in your PlayStation 4 settings, connect three cables and voila- you can now use any old universal tv controller as a fully functioning PS4 remote control. The beta version of Umotia is already out and will set you back just $25, but since it’s a Kickstarter campaign, you can get all sorts of goodies if you back the project with a little more buck. What I’m personally interested in is the ability to write your own software for Umotia and the developer is happy to provide you with everything you need if you back his project with at least $500. As a bonus you’ll receive a second, final version of the device, free of charge once the project goes mainstream.